Well, folks, it's March 31, which means several things, First and foremost, after a long, cold winter, and a rough start to spring, baseball season starts today. And although, the last time I checked, there was a 70% chance of rain for the New York Yankees home opener against the Detroit Tigers today, baseball fans everywhere are just a tad excited that their team's 162 game-long drama is about to begin. Beth is a diehard Yankees fan and she got this inked on September 16, 2005. For the record, the Yankees beat the Toronto Blue Jays north of the border that day 11-10 thanks, in part, to two Robinson Cano home runs and Mariano Rivera's 40th save of the year. 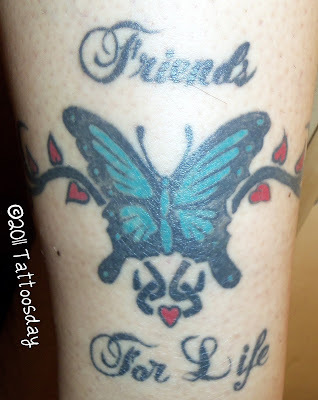 This is one of Beth's three tattoos, a fact not lost on me, as I have been wanting to post her ink on the site ever since we started back in 2007. However, we just never got around to it and this photo was shot last June in New Jersey by my wife, Melanie, at another cousin's baby shower. I thought, at the time, that we would save this picture for the day the Yankees won the World Series, but last year that ambition fell short in the ALCS. So we saved it for Opening Day, instead. The tattoo was done by Thomi Hawk at K & B Tattooing & Piercing in Hightstown, New Jersey. I should also add that, back in August 2007, I was sitting in my seat at PNC Bank Arts Center, between sets, when I noticed a very similar tattoo several rows ahead of me. I thought, "Man, that tattoo looks just like Beth's, and in the same spot [on her upper right back] too!" Of course, it was Beth, and we were both unaware that we were attending the show. And to think I spotted her in all that humanity by noticing her tattoo! I mentioned at the top of the post that it being March 31, meant several things. Aside from Opening Day, it's also opening day for the inkspotting season, as far as I'm concerned. Posts have been few and far between over the past few months and that's about to change. Tomorrow begins National Poetry Month, and we will be embarking on our third annual Tattooed Poets Project: 30 days of tattoos from poets across the country. And, I will assume, that I'll be having regular Tattoosday encounters, which will reappear in May, throughout the month. Thanks again to Beth for sharing her cool patriotic Yankees tattoo with us here on Tattoosday! 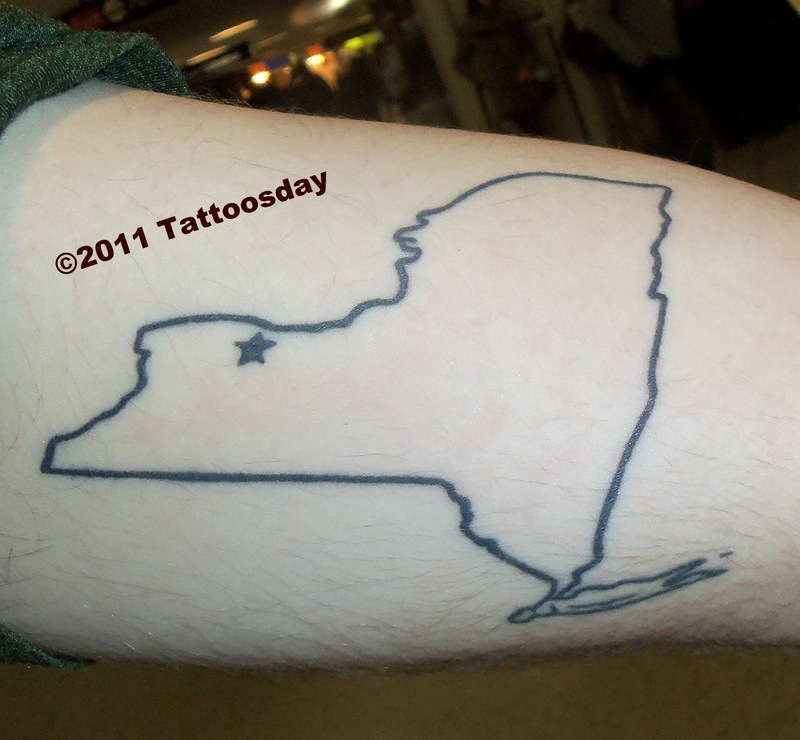 Yesterday in Penn Station, I met Jonathan, whose one tattoo caught my eye when I passed him in the Amtrak waiting area. The figure I imagined, of course, is really Long Island, and the balloon was the southern tip of the state of New York. Jonathan explained that he is from Rochester, marked on the tattoo with a star, and that he lived in the same house growing up there for eighteen years. It's a New York state of mind, indeed. The tattoo was done at Big Joe & Sons Tattooing in White Plains, New York. Thanks to Jonathan for sharing his stately tattoo with us here on Tattoosday! 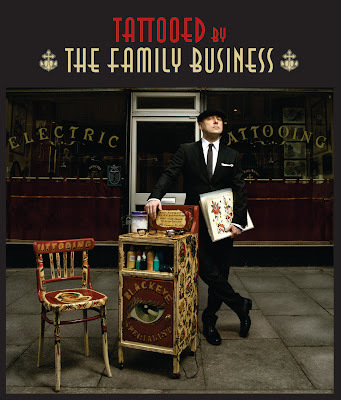 I’ll cut right to the chase: if you’re going to buy one tattoo book this spring, make sure it’s Tattooed by The Family Business, a feast for the eyes and a new standard by which all tattoo photography books should be judged. 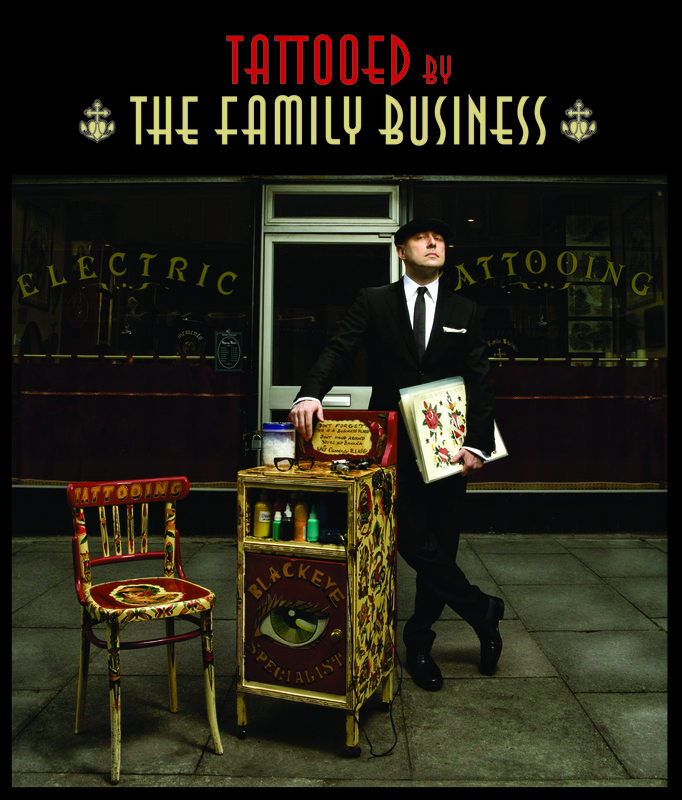 Simply stated, this book is gorgeous, heavy on high-quality photography, focusing on the wonderful body art created by Mo Coppoletta and his crew of talented tattooists at The Family Business Tattoo Shop, a London-based establishment that has been producing breath-taking work since 2003. If you're not familiar with Copoletta, or his studio, the book gives readers a peek inside the world of the Family Business. But aside from a one page foreword, and a couple pages of introduction, this lovely book is light on text, and heavy on images from photographers Fredi Marcarini and Chris Terry. The two hundred plus pages are filled with lush images of life in the shop and, more importantly, the high quality work created by the artists. Divided up into five sections, titled "The Family," "The Business," "The Art," "The Work," and "The Patrons," this is not just about Coppoletta and his own work. The reader is also introduced to the whole family: Kanae, Mie Satou, Dominique Holmes, Diego Brandini, and Diego Azaldegui. Some may draw comparisons to the books the American tattoo artist Kat Von D, which I have favorably reviewed in the past on this site. Tattooed by the Family Business is in a different league. It is as you would expect, Von D's books are busy and filled with words and images; whereas Coppoletta's book exudes a classiness to which other artists can only aspire. In fact, an online review hardly does it justice. Photography dominates and, whereas the tattoo, or the process of tattooing is always at hand, the beauty of the book also lies in its images. Ultimately, I believe, it's what most serious artists want to see in a tattoo book. Although some may criticize that, in some of the photos, the details of the tattoos themselves are lost in the framing of the photograph, I would argue that these images are just as compelling as the close-ups, as one sees the way the tattoos are placed, and how they flow along the lines of the human form. One of the neat features within this volume are several sketches on pages designed to resemble transparencies, where are laid over images of the tattoos themselves. The reader is treated to the full-page two-dimension image from which the artist drew his inspiration, and then can compare it to the end result. 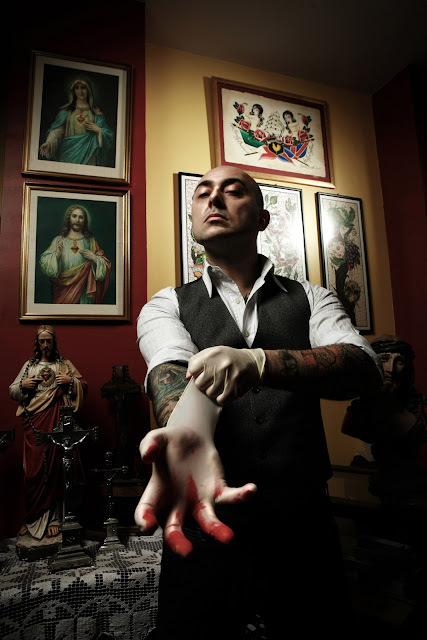 Here on Tattoosday, where most of the tattoos we see are from New York-based artists, I have, in several years, only had the pleasure of encountering Coppoletta's work once, documented here. Therefore, getting to see a more expansive look at his work, as well as that of other artists in The Family Business, is a real pleasure. Tattooed by the Family Business is a veritable feast. I keep returning to it, marveling at the craftsmanship and beauty of the tattoos. I highly recommend it to artists and aficionados alike. The book is a work of art in and of itself, and the fact that it so beautifully and simply celebrates the art makes it a must-read, a must-relish, and a must-have for every tattoo library. Moving clockwise from the upper left in the photo above, we start with an outline of Brooklyn, in honor of the borough in which Christine was born and raised. At the top of the other forearm is an om symbol, which captures her focus and has occasionally "helped with panic attacks." The two butterflies on opposite arms were inked in honor of her nieces, who both love these colorful insects. The shade of each represents their favorite colors. The Brooklyn piece was inked at Asylum Studios in the Williamsburg section of Brooklyn. 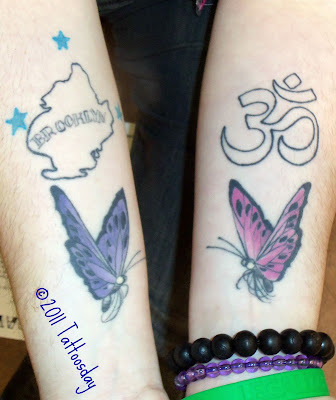 The om and the butterflies were done by artists at Three Kings Tattoo. 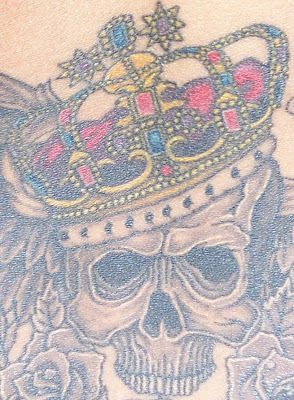 Both shops are in Brooklyn and have had work appear on Tattoosday previously here (Asylum) and here (Three Kings). Thanks to Christine for sharing these four of her eleven (!) tattoos with us here on Tattoosday! On Friday afternoon, I ran into Chris near the 34th Street subway station near the Manhattan Mall. Chris explained that this tree resembles a cherry blossom tree that he played on with his cousin when he was a kid. His cousin has passed, so this is, in essence, a memorial, "without being over the top". I found it interesting and quite poignant that I spotted this piece on the day of the earthquake in Japan, when the plight of the residents in the northern part of that country was on so many minds. The cherry blossom, as many know, is often associated with the temporary, fleeting nature of life. Chris credited Ryan at ArtCore Tattoos in Naples, Florida with this tattoo. Thanks to Chris for sharing his tattoo with us here on Tattoosday! The phrase "Be not afraid, only believe" is from the Bible, more specifically, the Book of Mark, Chapter 5, Verse 36, King James version. What does this mean to Emily? "No matter what," she said, "always remember what's mean to be will happen...". A nice sentiment indeed. This tattoo was done by "Petey" at Immortal Ink in Clinton, New Jersey. Thanks to Emily for sharing her tattoo with us here on Tattoosday! So it was another Saturday night in Bay Ridge and we had just got home from a friend's house. The kids were getting ready for bed. My youngest, Shayna, was having a birthday party the next day. We were pretty much set on the party planning, but needed gift bags for party favors. I headed off to the 24-hour Duane Reade, six blocks away. By the time I arrived, there were already a half-dozen things added to my list. I grabbed a cart (although in Brooklyn they refer to it as a wagon) and was somewhere in the haircare section (shampoo for kids) when two young ladies walked by. I had brought, as always, my Tattoosday folder with fliers in it, along with my camera, despite the fact that it was cold and in the thirties. But one can never be too prepared. These women were dressed for the clubs, coatless, bare-armed, and high-heeled. I spotted a tattoo on one of the women's feet. I thought about asking her then and there about it, but I balked. These were two attractive young women in a drugstore late at night and I wasn't up for the challenge of being scrutinized as a creep. 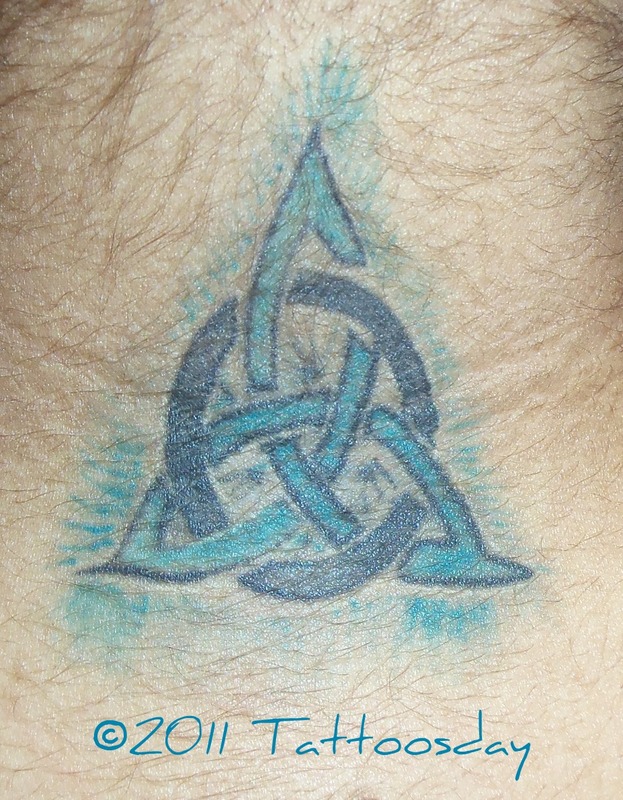 Besides, I reasoned, it's only a rosary tattoo. Nothing extraordinary about that. Let me just leave them alone, I thought, they're obviously headed to some club. But I ran into them/passed them a couple more times and, each time, I cursed myself more for being too cowardly to ask. So what if its just a rosary? 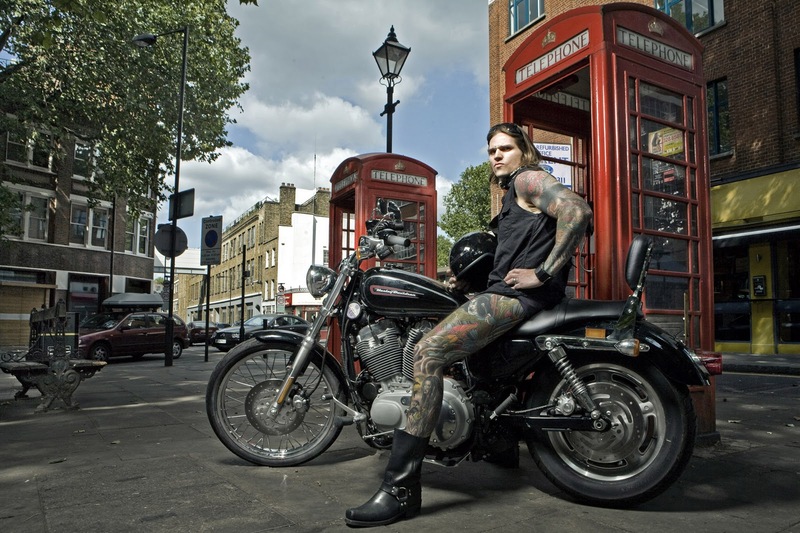 Here at Tattoosday, it's not just about the ink, but about the story behind the ink. I was at the front part of the store, trying to decide which individually-wrapped candies would be the least damaging to my children's teeth (for the party bags), when they headed my way, on their way out of the store. I figured, "what the heck?" and asked the young lady about her tattoo. Wow. Sweet. 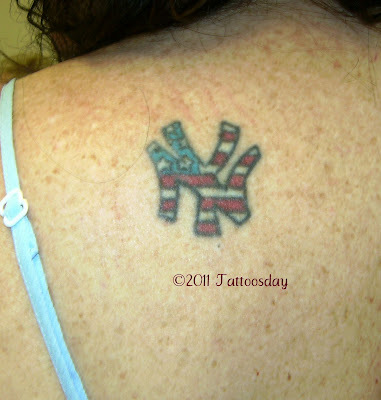 Which just goes to show, Tattoosday Rule #1: Don't dismiss the "ordinary" tattoo. There may be extraordinary ones just out of sight! Her name is Layla and she was very cool. I snapped the above shot and then asked if I could take the rosary one as well, since that's what caused me to stop and talk to her. I noticed that she also had a cross on her left forearm and I gave my standard Tattoosday patter: check out the blog in a few days, and feel free, if you like what you see, to email me if she wants to share more of her ink with the world. I turned to her friend, , and said, naively, and when you get a tattoo, let me know, and I'll put yours on too. She proudly replied, "I have seven already." Silly me, and then I noticed the rosary on her right foot. I extended the same offer: if you like what you see on the blog, let me know, we can always have you come back as a recurring tattoo feature. I thanked both ladies and they headed out while I went back to searching for the elusive gift bags. Thanks to Layla and Lisa for their willingness to put their night on hold, and sharing their tattoos! Mixing it up here on Tattoosday as I anxiously look toward spring and the third annual Tattooed Poets Project. One of the things I've taken to doing from time to time is googling "tattoo" and watching the "real time" feed, mostly tweets that appear and get swept up by the google logarithms. How else would I have found about DMBTattoo.com, billed as "A Dave Matthews Band Tattoo Collection Site"? 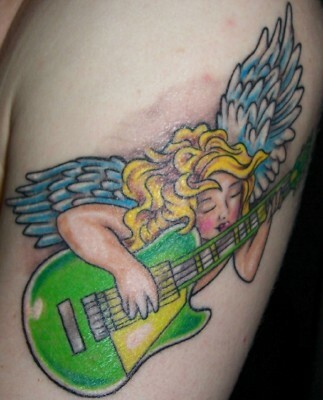 This reminds me, of course of Tattooed Everything, a site dedicated to Pearl Jam tattoos, which seems to have vanished. Of course, this parlays into my Tattoosday scenario of a semi-regular feature, yet to be launched, called Garden Ink, which will be posts that stem from my close proximity, Monday through Friday, to Madison Square Garden. Rather than spotting ink, the idea is to seek it out, on days that there are events at the Garden, the world's most famous arena. This means approaching people who are not necessarily visibly inked and asking them if they have tattoos specific to whoever is at the Garden that night. I did this once, successfully, here, with a Green Day fan. The idea recently resurfaced when the 'hood was besieged by Little Monsters waiting to see Lady Gaga. And finally, just when I thought I'd seen it all with Ed Hardy lighters, earlier this week I found, wait for it, Ed Hardy Hand Sanitizer! It actually smells not half bad. It's safe to say that Maida has been a fan of Tattoosday from its earliest days. Over the last three years, a day generally doesn't go by without our discussing ink. As a co-worker, and a friend, she's a regular visitor to the site. Which is why one might wonder why her tattoos have taken this long to appear on Tattoosday. I even recall discussing with her potential designs as she researched new ideas. We always talked about me taking pictures, but it never came to fruition. However, yesterday the stars aligned and we got our collective acts together. Let's take a look, shall we? These two are pretty cool, and the top one. 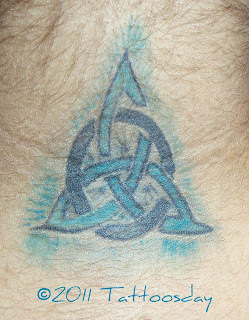 a triquetra, I remember her spending a lot of time thinking about. Maida says this dual image, the softness of the butterfly and the roughness of the skulls, represents the two sides of life, and is a double-edged sword. 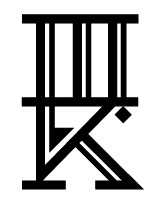 The kanji represent the symbols for power (top) and strength (bottom). Maida got this, along with her friend Kathy, as a testament to "the strong bond and love between two best friends". They each have it on the same spot, although Kathy's butterfly has lavender wings, whereas Maida's are turquoise. 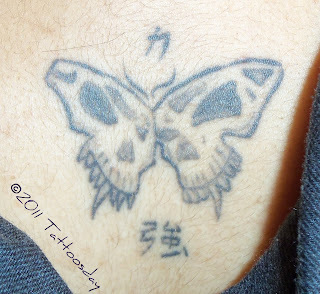 All of Maida's tattoos above were inked by an artist named JStar, whose website is here. The site includes photos of more of her work and is well worth a look. 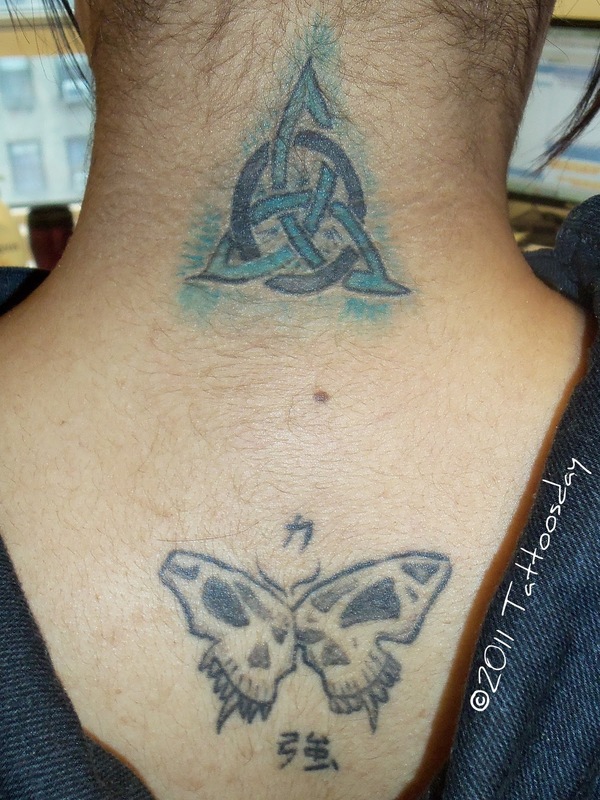 Thanks to Maida for sharing her tattoos with us here, finally, on Tattoosday! We look forward to seeing more in the future! On Sunday, spring-like temperatures made being outside enticing. I was heading home when I spotted, from a good fifty yards away, a young lady approaching. 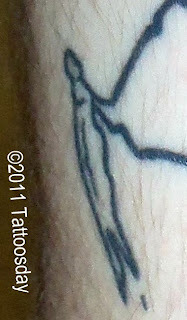 Even from that distance, I noticed her bare calves and the discernable mark of a tattoo above her left ankle. So, as she approached, I slowed down to talk to her. When I asked her about the tattoo, she indicated that I had stopped her before, which puzzled me, as I didn't recognize the ink. 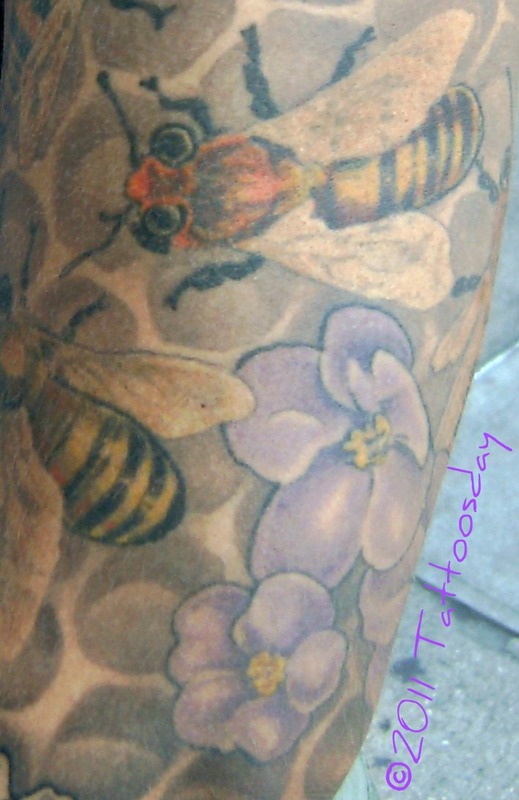 She then clarified that her right arm hosted a honeycomb sleeve, with bees. Since it was covered, I didn't recognize her. I first met Erika in July 2009 and stopped her after she walked by me on the street. At the time, she said that the sleeve was a work in progress, and she'd rather not have it posted. I asked if I could take a picture anyway, and promised it wouldn't go live until she was done with the art. I believe I ran into her (or maybe just saw her on the subway) last summer, and the sleeve still amazed me. Erika said this piece is about 15 years old and called it an omkara or aumkara. 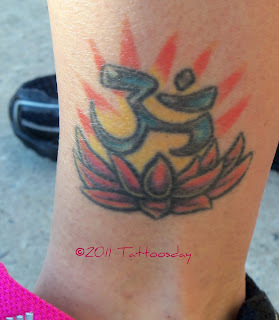 That would be an om symbol floating above a lotus flower. She also said that she had not had any more work done on the sleeve and she didn't mind sharing it at this stage of the game. The artist is in Portland, Maine, so it's not easy to just go and get it periodically updated. The artist of this honeycomb and her "killer bees" is Chris Dingwell of Sanctuary Tattoo. Thanks to Erika for sharing one of her older tattoos, as well as this phenomenal sleeve-in-progress!